Hello! 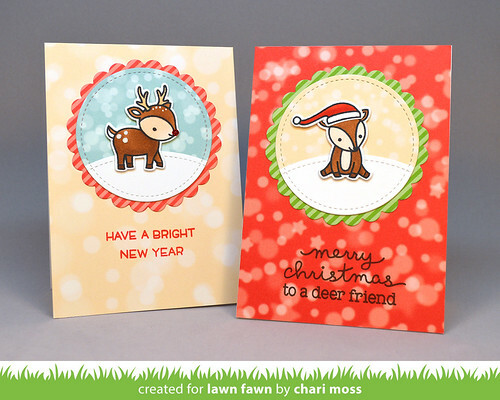 Lawn Fawn Inspiration week continues today with projects using the new Let's Bokeh in the Snow paper collection. I have a few simple cards to share with you today. These are easy to whip up quickly if you need something for the holidays in a pinch. One of my favorite things about this paper collection is the various sizes of bokeh patterns so you can pair multiple bokeh papers together and it does not look like repeating patterns. On these two cards I used larger size patterns for the card bases, for these I used the 12x12 papers, and then a smaller more condensed bokeh for the circles in the center. The colors of this collection are great for both winter cards and Christmas cards. Be sure to check out the Lawn Fawn blog for more fabulous projects with this paper collection. Oh my goodness Chari those cards are adorable. I LOVE that Bokeh paper! Beautiful! I love how simple the cards are, yet they are absolutely adorable!!! The paper and the stamp set are certainly the "Star" in all of your cards! These cards are adorable! I love the new Bokeh paper's! Just the cutest cards ever!